Two significant feasts occur back-to-back on 8th & 9th June: The Most Sacred Heart of Jesus and The Immaculate Heart of the Blessed Virgin Mary. 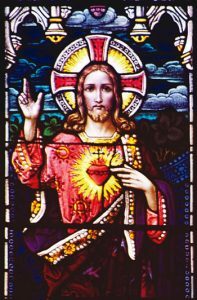 I looked in my collection of stained glass photographs, to find that I had mostly bypassed windows of the Sacred Heart because they were not strictly biblical (which was where my interest lay at the time). 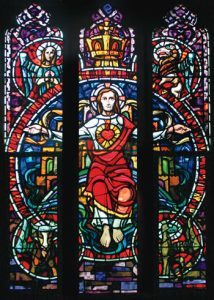 I found over thirty, about half being traditional windows of the Sacred Heart of Jesus, and mostly very much alike. But I did find that a significant number of them also featured the Immaculate Heart of Mary alongside, indicating that both are seen as important in the Church. This window  from St Mary of the Angels church, Wellington, is typical of the traditional style I referred to above. The most significant source for the devotion to the Sacred Heart was Saint Margaret Mary Alacoque (1647–1690), a nun of the Order of the Visitation of Holy Mary, who received apparitions of Jesus Christ in the Burgundian French village of Paray-le-Monial. Her first vision on 27 December 1673, was the feast of Saint John the Evangelist. The final vision, 18 months later, revealed the form of the devotion, of which the chief features were: the reception of Holy Communion on the first Friday of each month, Eucharistic adoration during a ‘Holy Hour’ on Thursdays, and the celebration of the Feast of the Sacred Heart. She said that in her vision she was instructed to spend an hour every Thursday night meditating on Jesus’ Agony in the Garden of Gethsemane. 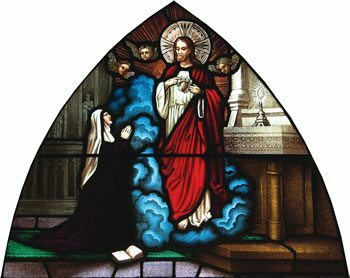 This window  from Scared Heart Church, Mosman, Sydney is one of many showing St Margaret Mary Alacoque receiving her vision and instructions from Jesus. Another source for the devotion to the Sacred Heart of Jesus was Sister Mary of the Divine Heart (1863–1899), who received appearances of Jesus with a similar message to St Margaret Mary. 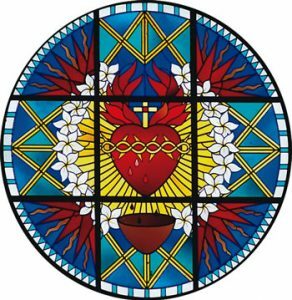 The part window  from St Mary’s, Whanganui, shows the typical Sacred Heart in more detail - the heart bound by a chain of thorns, on fire, radiating rays of golden light. The non-traditional windows I found much more interesting, as I hope you do. The window at right  is from the little church of St Winifred’s, Little Waihi, on the southern shore of Lake Taupō. I was fortunate to be granted access by the Māori guardians at the village, and was thoroughly intrigued by the Māori image of Jesus, complete with stigmata and Sacred Heart. There was also a companion window of the Blessed Virgin and Child. The only other church I have found with such uniquely Māori windows is St Pius X, Tokoroa. The Immaculate Heart of Mary is depicted beautifully in the part window below  in St Mary’s, Concord, Sydney. The window at right [6 ] in St Mary Magdalene’s, Rose Bay, Sydney is completely different from any others I have seen. Jesus is surrounded by the symbols for the four evengelists, and may have his wrists tied to a somewhat ornate yoke. pierced by the crown of thorns, bleeding into the kava bowl (highly symbolic to the Fijian people) and surrounded by the sweetness of the frangipani. What could be more representative of Jesus’ message to St. Margaret Mary Alacoque in the late 1600s?